As I already told you in my previous post, I am in my 4th year of engineering and Placement is really a big thing for any student in this important year. English Plays an important role in placement papers. Objective General English book is extremely helpful for Bank PO exams of SBI, ICICI, HDFC and other banks such as bank of Baroda, Bank of Punjab. Another important factor is that if you prepare from this book, it will be helpful in giving exams like CAT, XAT,MAT and other various competitive exams. Companies like Cognizant Technology Solutions has almost 25 questions in English to solve. 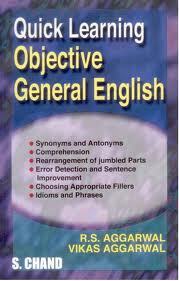 These questions can be easily Solved if you have read Objective General English by RS Agarwal. It Comprises of many things. You will be amazed to see every english related questions in this book. Here is the Download link. Please Copy and Paste this in the address bar. If You have any query let me know via Comments. please send link for book general knowledge. as i waz searching R S Agarwal Objective English pdf since so many days nd dont want to buy it. u sort out prblem. please send me the password related to all agarwal books to pragathi_shetty2004@yahoo.com so that i can download. Thank you so so much for this nice book! Im looking for 1 book too to study, so if you have it, I would appreciate so much :) its called "general english book by rs aggarwal"
rs agarwal general knowledge pdf available? In order to fix boot sector and BCD files easily and effectively, you can ask for a third-party tool for help. When searching such a tool online, many kinds of software are listed here. Among them, MiniTool Partition Wizard is popular in managing partition and disk, now it is recommended to you. As a professional and reliable partition manager, this tool can be used to resize partition, extend partition, copy partition, migrate OS to SSD/HD, convert between NTFS and FAT32, convert disk between MBR and GPT, rebuild MBR, recover partition and so on. This software must help you grub rescue windows 10.